How far would you go for love? Angie has always wanted to travel. But at 27, she has still never left her small mining town in the Australian outback. When her grandmother passes away, Angie finally feels free to see the world - until she discovers a letter addressed to the father she never knew and is forced to question everything. As Angie sets off on her journey to find the truth - about her family, her past and who she really is - will enigmatic stranger Alessandro help guide the way?How far would you go for love? Angie has always wanted to travel. But at 27, she has still never left her small mining town in the Australian outback. When her grandmother passes away, Angie finally feels free to see the world - until she discovers a letter addressed to the father she never knew and is forced to question everything. As Angie sets off on her journey to find the truth - about her family, her past and who she really is - will enigmatic stranger Alessandro help guide the way? 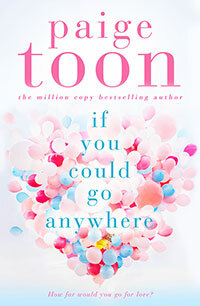 Paige Toon grew up between England, Australia and America and has been writing books set in sun-drenched locations around the world since 2007. She has released eleven fiction novels and a three-part spin off series for young adults. In 2014, Paige set up a club, The Hidden Paige, in order to share free short stories and extra content with her readers. Sign up at paigetoon.com or visit her website to find out more about the author and her characters.